Perhaps the most overlooked aspect of relay control is proper handling of inductive loads. Inductive loads can best be defined as anything with a magnetic coil, such as a motor, solenoid, or a transformer. 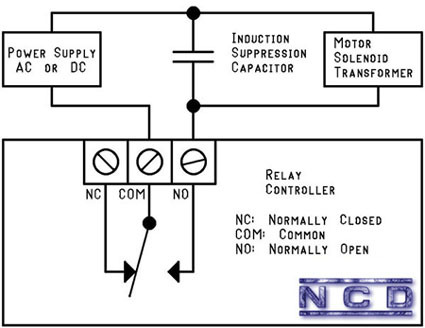 Controlling a inductive load using our relay controllers requires the use of induction suppression capacitors. The purpose of this capacitor is to absorb the high voltages generated by inductive loads, blocking them from the contacts of the relay. Without this capacitor, the lifespan of the relay will be greatly reduced. Induction can be so severe that it electrically interferes with the microprocessor logic of our controllers, causing relay banks to shut themselves down unexpectedly. In the case of USB devices, customers may experience loss of communications until the device is reconnected to the USB port. for more information view our Induction Suppression Video. 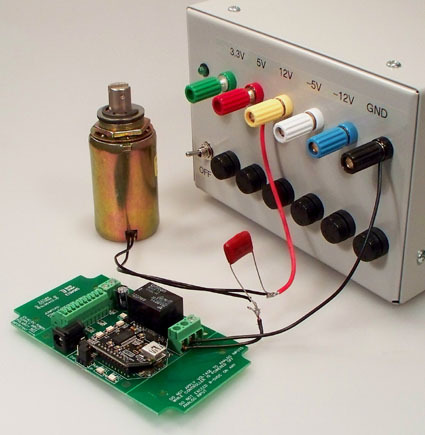 Choosing the correct induction suppression capacitor is simply a matter of choosing the maximum voltage requirement of the device you are trying to control. On this page to the right you will find a list of capacitors that we offer as a convenience to our customers. USB is particularly sensitive to inductive loads. USB establishes high-speed communications with the motherboard of your PC. If an error is presented on the USB port, the motherboard of your computer will disconnect the device from the operating system. In the case of USB relay controllers, you will lose communications until the device is unplugged from the USB port and plugged back in. When working with USB communications in combination with inductive loads, it is absolutely essential that induction suppression capacitors are used to help prevent loss of communications. Even with these capacitors in place, the possibility does exist that capacitors will not suppress enough induction to prevent periodic communications loss. Extensive testing is required in these applications. If problems persist, other communications mechanisms must be considered. If USB is absolutely required, then customers should consider using a USB Modem such as the ZIGMO and a short range wireless communications module. If direct wiring is preferred, a ZRS communications module will allow RS-232 communications between your PC and NCD devices with no complications. If your PC is NOT equipped with a RS-232 port, a USB to RS-232 adapter can be used in combination with NCD devices using a ZRS communications module. The RS-232 communications format effectively blocks induction to safe levels for a USB to RS-232 adapter to function without errors. Other options include a ZBT Bluetooth Communications Module or any NCD device with Solid State Relays may be used, as solid state effectively blocks all induction from reaching the computer. Please Note: THESE CAPACITORS WILL STORE DANGEROUSLY HIGH VOLTAGES FOR SHORT PERIODS OF TIME. BEFORE HANDLING, SHORT CIRCUIT THE CAPACITOR OUTPUTS AFTER USE.